Villa Floriana B: An elegant and welcoming apartment immersed in a splendid landscape, in the heart of a wonderful little town, with Free WI-FI. Bedrooms: 1, bathrooms: 1, sleeps 4. Villa Floriana B is an elegant and welcoming apartment immersed in a splendid landscape, in the heart of a wonderful little town. It sleeps four people. From Villa Floriana B you will enjoy a broad view of the valley and of the greenery. Villa Floriana B is 40 square meters (430 square feet). It features a shared swimming pool, two panoramic private terraces, a shared garden, air conditioning (please read description below to check in which rooms the units are installed), winter heating and WI-FI Internet access. Villa Floriana B is located on the second floor of a three story building. You will reach it from Villa Floriana B by way of an elevator. To stay at Villa Floriana B you will need a car. You will be able to park it free of charge in a parking space. Villa Floriana B is one of the holiday homes available in a small complex (you can find these holiday homes on this website). Please find a general description of the complex below, and please scroll further down for a description of Villa Floriana B.
Villa Floriana is a beautiful villa built as a vacation home. It features terraces facing the sun and the wide scenery of the valley and the hills. It is at about 400 meters (about 1,312 feet) of altitude in a prominent position on the slope of a hill overlooking the valley of Valdinievole, formed by the river Arno. The villa is in the middle of a small &ldquo;fraction-town&rdquo; of San Baronto. You will be in the area where the Chianti wine is produced. And as an addition to all the cultural visits, don&rsquo;t forget to stop at the beautiful wine cellars of the area while taking the &ldquo;Strada del Vino&rdquo; (Road of the Wine). Don&rsquo;t miss out on having lunch in one of the characteristic trattorias, often attended by local people and where you will taste the genuine Tuscan cuisine! The furnishings of the living room are elegant. The furnishings include a divan that unfolds into a double bed. In the living room you will also find a cooking area. The kitchenette is equipped with a two-burner electric cooker, a refrigerator with freezer and an Italian-style coffee-maker. The dining table can accommodate four guests. In this room you will find a satellite television (local channels). From the living room you will be able to enter the terrace through a French door. You will be able to enter the bedroom living room. The bedroom has a matrimonial bed (160 cm/62 inches, wider than a queen-size bed). From the bedroom you will be able to enter a terrace through three French doors. The bedroom is equipped with an air conditioning/heating unit. This bedroom has an en-suite bathroom, equipped with a washbasin, a toilet and a fully enclosed shower. Yes, we enjoyed our stay very much! The host was very friendly and helpful and the accommodation was, as always, excellent. You have more detail on your web site than other places... Making our choice easier. We have used you before and know you to be reliable and friendly. Amazing location with unbelievable views. Location, people everything was more than expected. You are the best. It was our first time with Summer In Italy won't be the last one for sure. Thanks Luca and crew. We thought Villa Floriana B was excellent. The terrace was amazing and we were thrilled when we first walked into the apartment to find how modern and clean it was. What made our stay however was the fantastic welcome we received from the apartment manager. She could not have been more charming and helpful. Nothing was too much trouble for her. We would certainly recommend this accommodation and Summer In Italy. It is the first time we have used Summer In Italy and we would definitely check your website before any other. Thank you. We had the absolute pleasure of being guests of Villa Floriana B for nearly three weeks. The view from our terrace was breathtaking and we could not believe how handy everything was. Just a few steps from our front door there were deli, restaurants and bars. 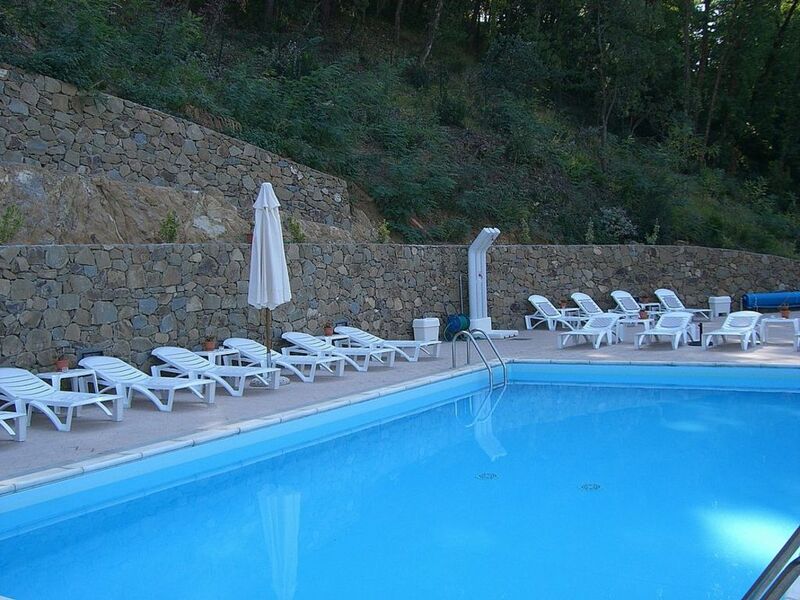 We would recommend Villa Floriana B to everyone and would definitely go back. The two lovely ladies who welcomed us, Sofia and Maria, did everything they could to make our visit memorable. Keep doing what you are doing! Luca, you made everything so easy and we would book through Summer In Italy again for our next visit in Italy. Thank you. We loved every minute of our stay at Villa Floriana B. After a number of day trips, it was wonderful to return for a swim in the pool looking over the Tuscan hillside views and stroll to a nearby restaurant for dinner. After meeting up with family in Florence, we picked up our rental car and headed west to San Baronto. We called the owner of Villa Floriana B as we left Florence to let her know we would be arriving in approximately an hour. The drive from Pistoia is easy, but has many curves as you climb to the top. Beware the cyclists, this area is popular for cyclists, which was exciting for us since we were planning on doing some of our own. When we arrived at Villa Floriana B we were greeted by Sophia [the caretaker] who is molto gentile. She showed us our apartment, which had beautiful views looking over the hills, valley, and mountains in the distance. Sophia was kind enough to show us other apartments for future consideration. Each one was clean and spacious. It would be important to specify your preference with a view. Hope to return to San Baronto in the future. The rental price includes: electricity; linens; towels. To be paid at the property:final cleaning EUR 20.00.